Two recent Autodesk applications help creating 3D objects and displaying them interactively in 3D - also on mobile devices. Both are free. The first one is Autodesk Project Photofly - described earlier on this blog. Photofly magically converts a series of photos to a 3D model. Autodesk names the Photofly project an "early beta" but it works pretty well for an early beta. Great tips for using Photofly are summarized on the Shaan Hurley's blog. We have perfomed additional tests and here are some tips: avoid glossy surfaces, don't use flash, do not combine multiple camera types, try to avoid zooming, fix the focal length if you shoot the scene with a camcorder, walk around with the camera - do not rotate the model. Avoid running the Photofly's Photo Scene Editor in Windows Vista (frequent failures, missing features). You can see some good and bad examples from our tests (the 3D results) on the Photofly tests page. A nice tip from Scott Sheppard allows to share your 3D scenes using just a single, supersmall 3DP file. You can try it on our 4kB small Pejsek.3dp file (doggie). Just download the file, run the Photo Scene Editor and open this 3DP file as an "Existing scene". Choose "Download" to get the missing source images and the missing mesh (3D scene) from the cloud. One of the publishing option in Photofly - IPM - takes us to the second new application by Autodesk. With the longest name among Autodesk tools, for the smallest devices, it is the Autodesk Inventor Publisher Mobile Viewer for Android (aka "IPM Viewer"). For some time, IPM Viewer was already available for Apple iPad and iPhone. Now it comes also for Android-based devices - tablets and mobile phones. It can be downloaded from the Apple and Android Markets. 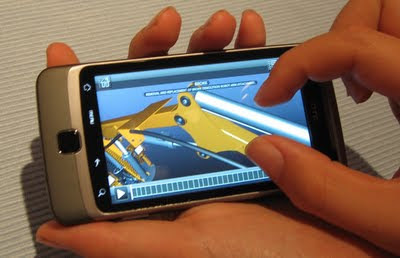 You can use your mobile phone to open a IPM file and surprisingly smoothly rotate and pinch-zoom it in 3D. Don't be surprised that there is no Open command - any IPM file you get in your e-mail or via Drop-box will be opened in the IPM Viewer automatically. IPM is a combined 3D format which includes the 3D geometry, textures, animations and textual notes. It can be published from Inventor Publisher, a digital prototyping tool for making electronic assembly instructions and service manuals.